The Thurston County Board of Commissioners established an Agriculture Advisory Committee in 1978 to advise the Thurston County Commissioners and Planning Commission on public decisions and/or emerging issues that would significantly affect agriculture. Additional functions are to review local, state, or federal programs identified by staff that could affect Thurston County agriculture; to conduct a regular review or evaluation of County efforts to protect and support agriculture; to consider and recommend new initiatives; and to work closely with WSU Thurston County Extension and other groups to help them support agriculture. The Committee is composed of eleven members serving two-year terms. Four members are to be non-farmer members to represent rural residents who may be affected by County efforts to protect farmland. Seven members are to be farmer-members representing a variety of the agriculture commodities produced in Thurston County and geographic areas of the County. Members may appoint alternates to serve during an absence. Ex-Officio members are appointed by the Board of Commissioners. Current ex-officio members are staff from the WSU Thurston County Extension offices serving Thurston County, and the Thurston Conservation District. Ex-officio members participate as other appointed members in discussions and may designate alternates to serve during an absence. Meetings times are 7:00 p.m. to 9:00 p.m. Special meetings may be called at the discretion of the Chair. Regular meetings may be canceled by the Chair. See below for past meeting minutes and materials. The goal of the Working Lands Strategic Plan is to help ensure the economic viability of farm and forest lands so property owners are more likely to stay in business rather than convert their land to urban uses. Thurston County and its residents will benefit from a healthy agricultural economy, the protection of irreplaceable growing soils, and the continuity of the rural character that makes the region such a desirable place to live. 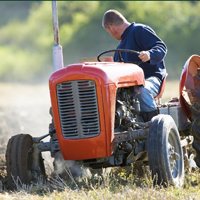 This plan is the result of many years of dedicated work by the Thurston County Agricultural Advisory Committee and contributions from the county’s working lands community. It contains ideas, suggestions and recommendations presented by stakeholders at a focus group meeting, a public meeting, and at Agricultural Committee meetings. The strategies presented in this plan are based, in large part, on their input.